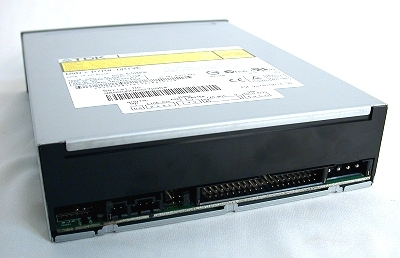 Last year we saw how CD-RW drives became the mainstay of every home and office PC systems with its affordable pricing and easily accessible (and low-cost) media. A good 52x32x52x drive will cost you no more than S$80 these days, and a single piece of CD-R media will probably cost you as much as just a can of Coke. But as with every other technology, the CD-RW also has its own limitations. For one, a CD-R disc can hold no more than 700MB worth of data (Overburning limits it to 990MB, but that's another story) and 52x is really the fastest speed a drive can burn up to. So what's next? Well if you have noticed, a lot of optical storage vendors are now turning towards the DVD media - DVD writing to be exact. The faceplate of the 880N is no different from the one seen in its predecessor, the 440N. While DVD writers still have yet to come down to the same pricing level as CD-RW writers, today's DVD writers can still be considered affordable as compared to a year ago. A dual-format 4x DVD writer, for instance, will cost around S$250 - no longer the premium S$500-S$700 range here. Granted that's still about three times more than a CD-RW, we should note that a DVD media can easily store close to seven times the capacity of a typical CD media and that's an important consideration for many people and companies, since a larger capacity media can significantly reduce the total cost of ownership (E.g., lesser space is needed to store one DVD media as compared to seven CDs and less time is needed to split up large files so that they fit into one single CD). There drive's rear sports the standard layout seen in any other drives. So with the main benefit of the DVD media discussed above, let's take a look at another technological leap that DVD writing technology has made so far in terms of speed. Although DVD writing speed has not increased as dramatically as CD writing has, it certainly did made headways over the last six months - with 8x now catching up as the mainstream speed for DVD writing. 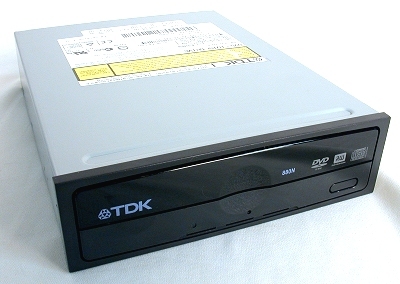 With that said, let's take a look at one of the earliest adopter of the 8x writing speed in the new TDK AID+880NA 8x DVD±RW drive. While dual-formats seem to be the way to go these days, many vendors have stuck to an 8x DVD+R and a 4x DVD-R terminology. The TDK drive however, goes one step further with 8x writing on both +R and -R formats. But impressive specifications aside (the drive also boasts one of the fastest CD-RW terminology for an 8x DVD drive on paper too), how does this drive fare in our benchmarks? Read the next few pages to find out.